The birds are chirping, the sun is rising, I’m in the kitchen whipping up a batch of Zucchini and Apple Muffins while the kids cheerfully start getting dressed and ready for the day. I’m sure this scenario is NOT how you start your day either. It’s more like the birds are chirping, the sun is rising and the kids are pawing at the side of the bed begging for breakfast that isn’t even a thought in my groggy mind. The first situation is not going to happen. So I need a plan for breakfast if I’m going to keep the kids from going a little crazy before I get my coffee. As the primary meal planner and maker, it’s easy to thing that every meal must be a feast with bells and whistles to boot. Thankfully that is not the case. Breakfast meal plans don’t need to be complicated. Keep it simple – Smoothies and toast, oatmeal with fruit, scrambled eggs and greens are all easy to make and inexpensive. You don’t have to go overboard with breakfast. You can list ideas instead of planning for specific days if that makes it easier. 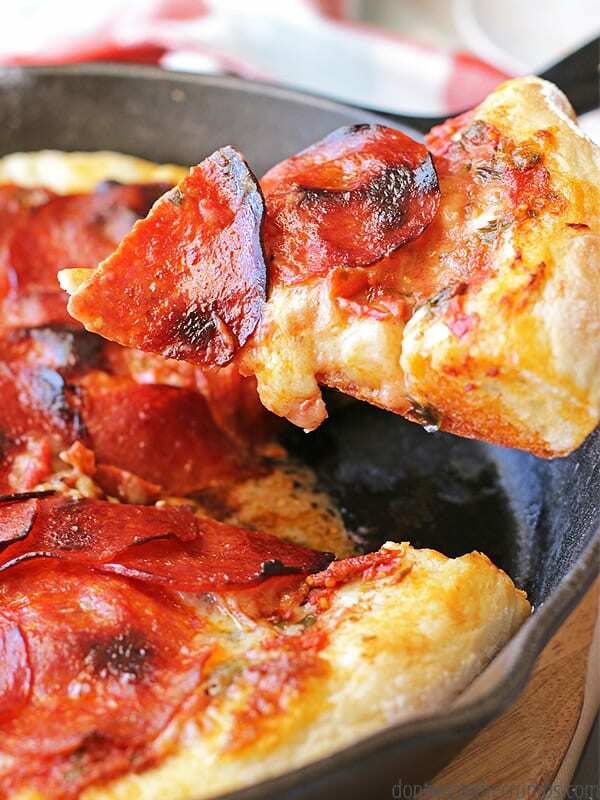 Make a double batch – When you have the time to make a bigger breakfast, bake a double batch. Save for later in the week or freeze for the next week. This saves you a ton of time, especially for mornings that are rushed. Planning for breakfast doesn’t have to be complicated or detailed – it just has to be planned. 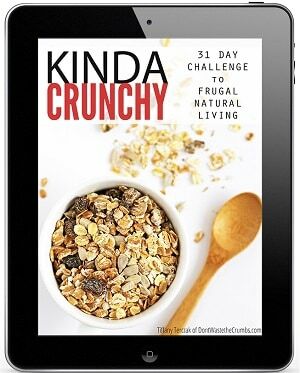 Whether it’s seven days of oatmeal or one day of pancakes with six days of leftovers – just plan something! This month’s meal plan is still only dinners, but I highly encourage you to add breakfast ideas to your meal plan. It makes the mornings a whole lot smoother and parents less grumpy. Hand over the coffee please! 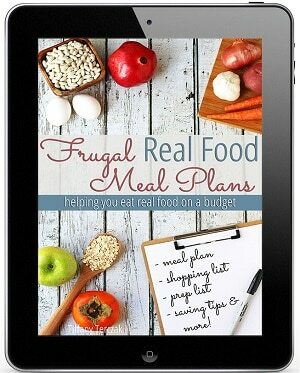 Click HERE to download the 14-day Frugal Real Food Meal Plan with recipes and shopping list. 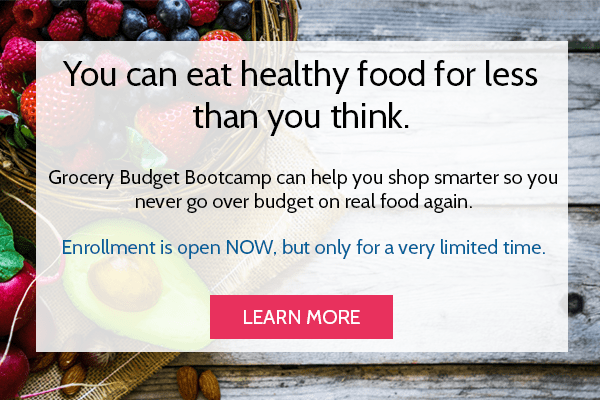 This meal plan is designed to feed a family of four for approximately $350 a month. The prices in your area will vary and change with any adaptations. 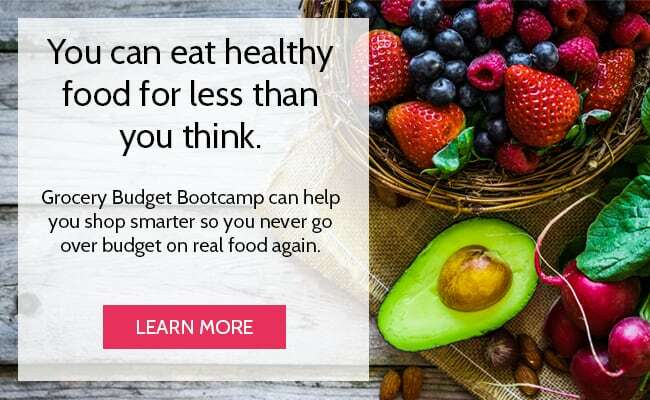 Many of the meals on this plan use portions from a prior meal. Keep in mind the cook-once-eat-twice mentality if you make any changes. Planning breakfast, lunch AND dinner is a big task. But the more you plan the more you save time and money. 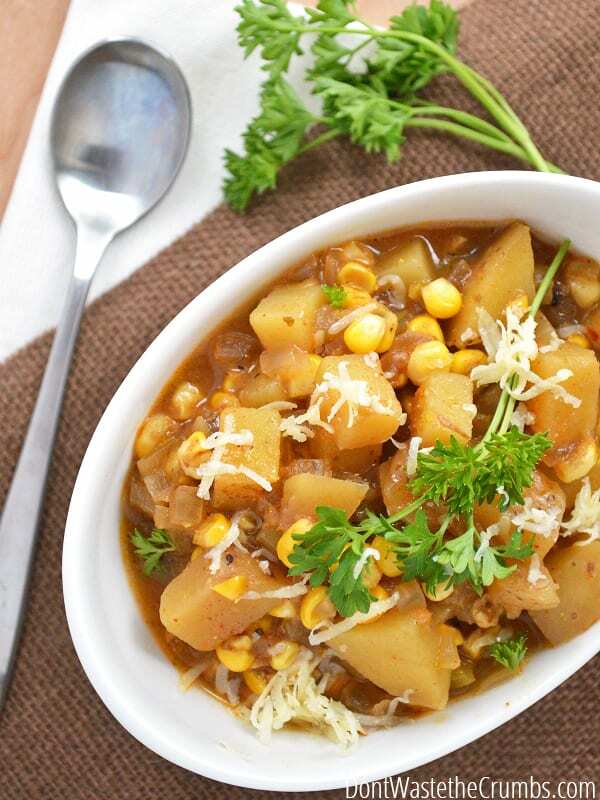 Feel free to use more of my meal plans and browse the recipe archives! 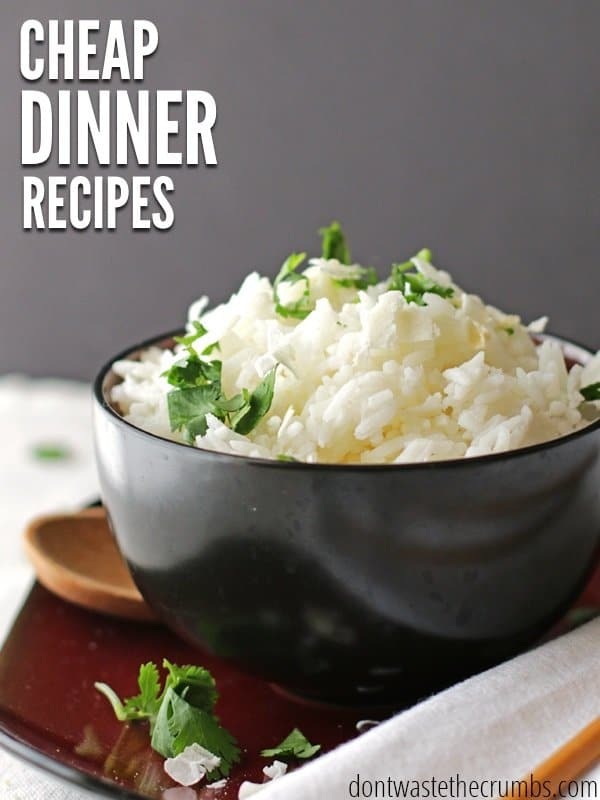 What are your favorite cheap dinner recipes? Thanks for the shout out! Love your meal plan!! 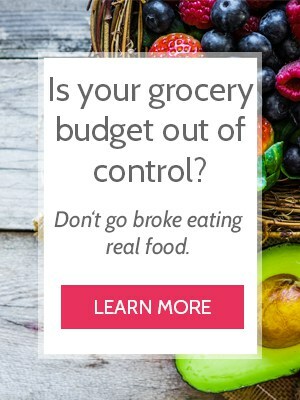 But you know me and meal planning – LOL! Keep up the great work! I’m definitely going to have to give some your tips and recipes a go! YUM! 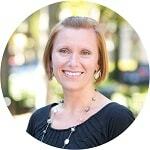 You’re welcome Kelly – LOVE your ideas! Thank you for the encouragement!! I’ve been looking over your meal plan and am wondering…do you really only use one chicken breast and tender to feed 4 people for one meal? Even the two thighs and 2 drumsticks for 4 people seems like nothing…My husband is 6’3″, 245, and would eat a salad, a big pile of veggies, a large baked potato plus 2 drumsticks and a thigh no problem. Also, I’ve been looking at your shopping lists and I feel like there are hardly any toiletries or paper goods on there (face lotion? toilet paper? etc.)…. Yes! We really only use one breast and one tender for the four of us! Believe me, my husband can take out some serious food if he could, but he also knows that I only cooked so much meat for the meal (after carving it up, I package it separately in baggies and only pull out the one bag, so there isn’t more to eat because nothing else was cooked). If I did make more, then I’d be “stealing” from future meals in the month. We’re on the same page regarding how much meat we buy each month and sticking to it so that we can stay within our budget. However, if there’s any meat leftover after we’ve all had our share, it’s understood that he gets it. 🙂 Allotting an entire chicken leg for just him is a very special treat! One thing that has helped is not serving the meat whole. In most cases it’s chopped or shredded, and if it is a whole piece (like for sandwiches or chicken parm), each breast is pounded out to even thickness and then cut in half, essentially creating another serving. Most meals are served with the mentality that the meat is a side dish and everything else is main. I buy other toiletries like razors and feminine products when they’re on sale at CVS using reward money. Those are in the shopping trips too, but it’s been maybe a month since there was a sale worth taking advantage of. 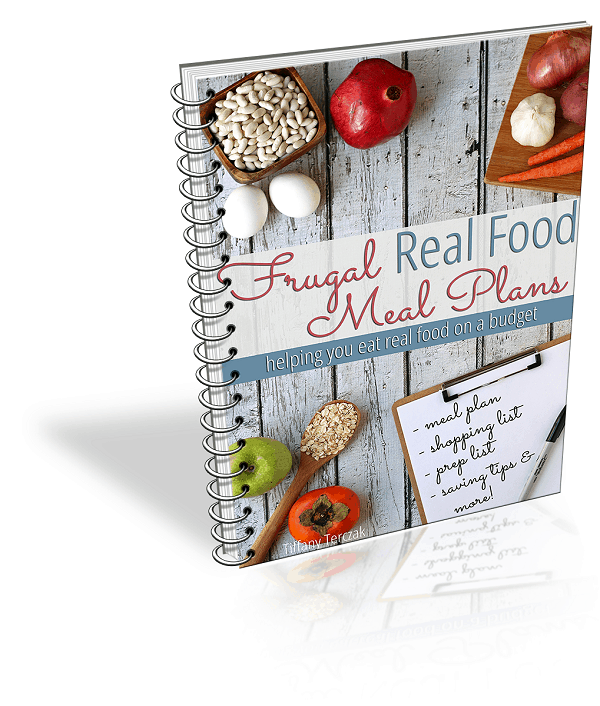 Enter your information below to have the 14-day Frugal Real Food Meal Plan (including recipes and shopping list) delivered straight to your inbox!